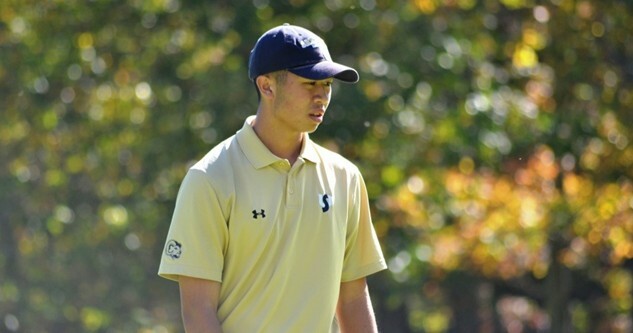 Senior Brandon Dang, pictured here last season, and the Rams could not carry over the momentum from their performance on Monday into Tuesday's second and final round at the MEC Fall Invitational. 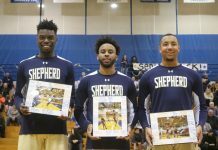 (Photo courtesy of Shepherd University Athletics Department). Shepherd came third place in the MEC Fall Invitational at the Stonewall Resort in Roanoke, W.Va. out of 12 schools, which lasted from Monday until Tuesday. As a team, the Rams shot a respectable score of 648 over the course of the tournament. West Liberty shot a team score of 636 to take the championship, which was 12 strokes better than Shepherd. 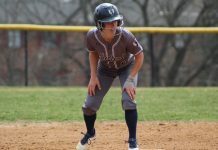 The Hilltoppers displayed strong play throughout the tournament, as they showed great consistency. However, after the first day of the tournament on Monday, the Rams were in great position, as they shot 315 in the first round, which was one stroke better than West Liberty’s 316. Day two proved to be a different story for the Rams, as they shot 333 on Tuesday. The Rams simply did not execute as well they did on Monday, which is something they likely will keep in mind as a learning point going forward. The head coach of the Rams, Edward Dolan, mentioned after tournament that the course at Stonewall Resort did have its challenges. Sophomore Mike Graessle had a remarkable tournament to remember for the Rams. He shot a score of 156, which was good enough to earn him the second-best score in the tournament, just one stroke behind senior Cory Hoshor of West Liberty, who shot a 155 to lead all players. Graessle did not have to carry the team by himself, however, as two other Rams finished in the top ten in the MEC Fall Invitational. Sophomore Owen Elliott recorded a score of 158 to come in a tie for fifth place overall, as he was able to place his shots with nice precision. Senior Brandon Dang finished just two strokes behind Elliott, placing him in a tie for ninth place overall with a score of 160. Graessle, Elliott, and Dang carried the Rams, but not all of their teammates enjoyed the same levels of success. Sophomore Trey Euler struggled adjusting to the course a little bit, as he shot a score of 174 to put him in a tie for 35th place. Junior Drew Call also was unable to get into a groove, as he posted a score of 182 to come in a tie for 42nd overall in the tournament. 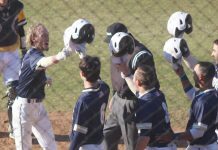 In essence, the Rams played well for large durations of the match, but could not quite put it all together when they really needed to do so. Dolan was impressed by what the level of competition was like in the MEC Fall Invitational. Dolan also addressed what areas the team performed better in than in previous matches. The Rams will be aiming to continue their strong play at the MEC Tournament, which starts next Monday, Oct. 9, and lasts through Wednesday, Oct. 11. Next articleShepherd Men’s Soccer gets overpowered by Wheeling Jesuit 5-0.